Our Bonn ChromaZone®, 2020+ color forecasting workshop was hosted by RAL Colours in their inspirational color studio. 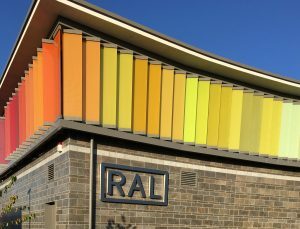 The beautiful RAL Colours’ building is capped with bright colors in a natural setting and has a beautiful state-of-the-art conference room. 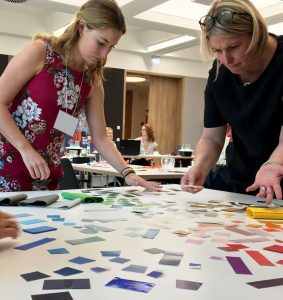 This was the first ChromaZone held in Bonn, Germany and its location provided easy access for European color design professionals to gather and forecast 2020+ color directions. Our workshop drew 18 color designers from interior design, architecture, graphics, textile, and automotive industries. Participants had the opportunity to share their color trend research with the group. Coming from varied industries, each emerging trend presentation was unique. The trend discussions moved from looking back to being able to move forward and learning from our past mistakes. Looking ahead, our discussions identified that socially there is a problem of engagement with what is happening around us (i.e. environment, mental health, and acceptance of others). From this lack of engagement springs a most interesting, yet alarming, social trend quote, “I’m sorry for not having an opinion”. How will these drive color directions for 2020? With the Bonn ChromaZone wrapped up, the colors for CMG’s 2020+ World Color Forecast are complete. In Philidelphia this November, WE GATHER IN COLOR to reveal the 64 final 2020+ colors for application across industries. It is not too late to be present when the colors come to life. Join us at our International Summit.